Bits of My Own: Look what I won! Recently I visited Teresa's blog Sew Many Thoughts. I really admired her turkey dishcloth. As luck would have it she was having a give-away, and I won! I think it is a terrific idea! 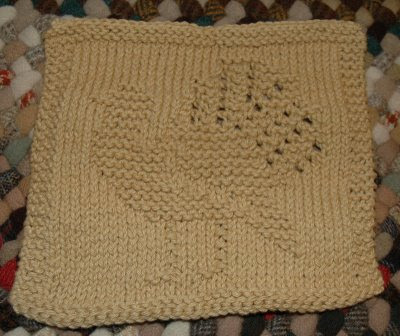 I have some plain knitted dishcloths, but no turkeys! I love Thanksgiving, and it just seemed to be a perfect fit in my kitchen! I love the harvest color! It really looks much too nice to use! Thank you very much Teresa! I will enjoy it! Just no hurrying this rug! Slowly I creep. . . , inch by inch!